Apple Safari carpet-bombing is a vulnerability that allows remote attacker via malicious website to silently download arbitrary files in users’ default download directory (~/Download). This issue became serious in Windows because the default download is in users’ Desktop. Attackers can craft any file to look like a link file (.LNK) and or image file (.JPEG) to entice users into clicking it. Apple immediately address this issue in Safari for Windows 3.1.2. However, Safari Mac OS X users remain exposed to this vulnerability. In May 2008, Nitesh Dhanjani disclosed details about this flaw and a year later, while I was writing my paper for VB2009, I revisited this issue and found that it is still unpatched. I have contacted him and verified whether my findings is true, and unfortunately he answered “yes”. Ok, two years later, again I am writing and reviewing same old tricks, and found that Nitesh Dhanjani recently revisited this issue in his blog post titled “2 Years Later: Droppin’ Malware on Your OSX, Carpet Bomb Style (and Then Some!)“. I smiled when I saw the screenshot and bonus notes, it reminds me how tricky it can get when it’s combined with other known tricks/exploits – makes it easier to get users’ click. 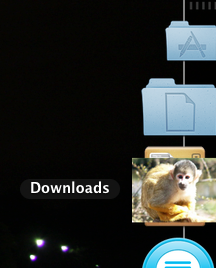 What is this monkey doing in my download? Opss, carpet-bomb! That monkey is a trick, it’s not an image file.